We answer these questions through a combination of measurements, analysis, and modeling. The LASP Solar Influences group builds accurate and precise instruments to measure the light from the Sun and we analyze the data from those instruments. 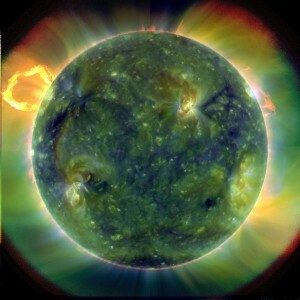 We also model the Sun, how it emits light, and how that light interacts with Earth’s atmosphere. The LASP Solar Influences group focuses on Sun and climate, space weather, and solar modeling. We also maintain an archive for all the solar irradiance data sets measured by our instruments; see the LASP Interactive Solar Irradiance Datacenter (LISIRD). In addition to professional scientists, the Solar Influences group actively trains the next generation of scientists by involving graduate and undergraduate students in all of our research projects. Click on the image for a PDF (721 KB) of LASP Solar Influences.